So I kept at it. Two more examples of Crux. See today's earlier post for the first batch. I also wanted to try Crux as a background for a card. The dragonfly was cut using a Spellbinders die. I used this technique I found on You Tube. I think I'll be trying more of my dies with that technique. I used Yasutomo Pearlescent Watercolors for color on both the tangle and dragonfly. Both are great. 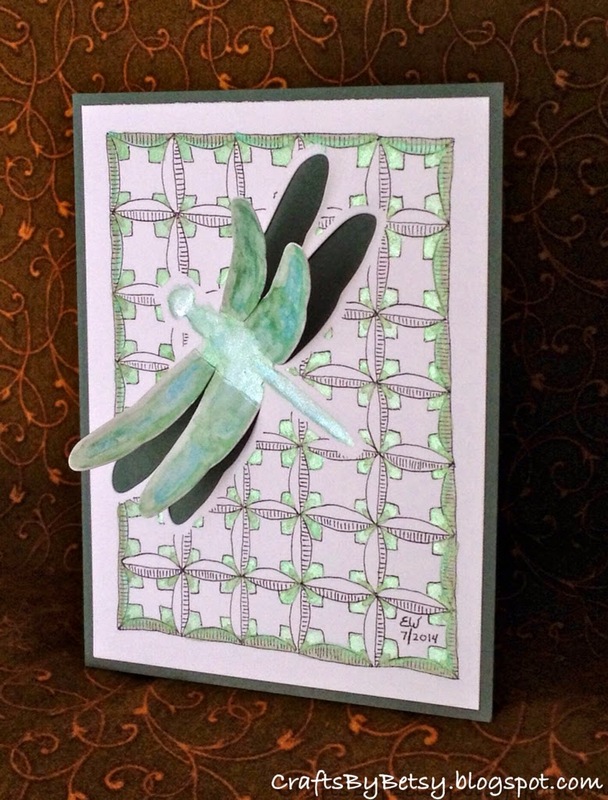 Placing Crux behind your dragonfly works beautifully, especially with your soft tones and coloring. Nice combination of colors. Your one behind the dragonfly looks like a variation of Bales. Both are wonderful! Especially I like the soft colours! Nicely done! Very well done and great colors. Love both Betsy but I especially like the card, I love making handmade cards and this is a great idea for a background. 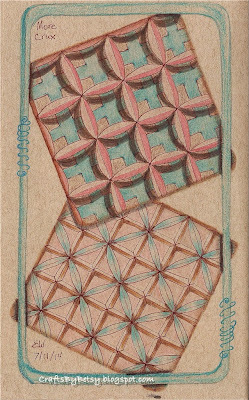 Fun color choices, too! Hi from another CZT14. Amazing how many people I actually met and how many I didn't get to.